Drama/Romance, USA, 1977, 119 min. Tagline The generations change. But the choices remain the same. Synopsis Former dance colleagues Deedee and Emma are reunited when Emma's New York ballet company stops in Oklahoma City for a performance. Having dropped her career for marriage and motherhood, Deedee envies prima ballerina Emma's limelight life; aging Emma, realizing that her days as a star are numbered, wishes that she had the fulfillment of a family like Deedee's. 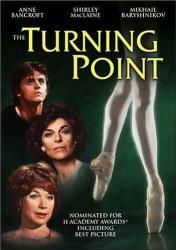 Tensions simmer when Deedee's talented teenage daughter Emilia moves to New York to join Emma's company. As Emma maternally bonds with Emilia, and Emilia falls in love with womanizing dancer Yuri, Deedee feels that she's losing her place even as a mother. After Emilia's triumphant debut, Deedee's and Emma's resentments boil over into an all-out catfight that ends when they realize that they can unite in happiness for Emilia's future.